Robin, with Alan, helps with essential office functions of Bridgewater Motor Works. Robin, known for keeping a low profile, is not afraid to take charge if anything gets out of hand. 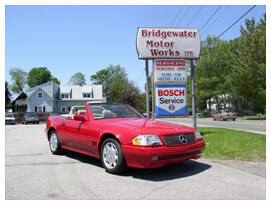 She has been an integral part of Bridgewater Motor Works since 1990. Robin is the proud mother of two daughters and answers to "Granny" to her six grandchildren. In the last few years she has helped with the babysitting to allow Sabra to go back to work. Two nights a week Robin also teaches art on a volunteer basis at a local nursing home.